Fry, sear, scramble, and saute all of your signature dishes in this versatile 8" non-stick aluminum fry pan! Its non-stick coating makes clean-up fast, and with a shallow, curved wall design, this pan allows for easy stirring and prevents steam from forming in the pan. This non-stick pan is good for the price but the non-stick coating peels relatively easily even with only moderate use. I would recommend getting a slightly more expensive pan with better coating if you can afford it. Thank you for your feedback! We are sorry your Choice 8 inch Non-Stick Aluminum Fry Pan did not work out for you. Corrective action has been taken and a Customer Solutions Representative has credited your account. Just a great work horse, that's why we have several in the kitchen. I use these daily and my staff love them as well. Great non-stick pans that we use every service. Very durable, but we only use silicone or bamboo spoons to avoid scratches and we only hand wash. This is a great fry pan. Very well built using the correct aluminum gauge. The Non stick is great for making eggs or small things. Highly recommend it to use wood, silicone or bamboo spoons to avoid scratches. These non stick aluminum fry pan are perfect for our busy restaurant. Our kitchen staff loves to cook with them. They are perfect for our needs. All of the Choice kitchen stuff we buy saves us a lot of time. these non stick pans are well built and last just as long as the name brand. we use these 8 inch on our egg station. This item is much smaller than I had imagined, however it is very handy and useful. It works very well and is very easy to clean. This pan is the perfect size for frittatas. The non stick does its job perfectly, even with our egg white frittatas too. We have several of these and they hold up great. I use these for my omelets and they are absolutely perfect. I love them and I love the price even more. I would definitely buy them again. This is a great aluminum fry pan with non-stick coating. The whole pan is heavy duty, and the handle is riveted strongly to the pan. The non-stick coating seems to be long lasting. I recommend adding a silicone handle grip that prevents the heat from the pan from transferring to your hand. This 8 inch pan is perfect for eggs in the morning. These pans never stick but they will scratch if you use steel or anything besides plastic or wood. We use this non stick aluminum fry pan for so many different things. It has held up very well from the abuse that it takes in our kitchens and all of our chefs really seem to like it. This is a great non stick frying pan. I use it mainly to fry eggs and works great. It is durable and easy to clean! I use this frying pan in my kitchen for eggs. I also use it to reheat hamburgers or chicken patties that are precooked. The price is very good. I really love this non stick aluminum fry pan. It is real non stick, does a great job and the quailty is beyond exceptional. Will be buying another one. The non-stick coating works well, however the handle conducts heat enough the rubber insulating handle does not stay cool enough during service. Staff needs a rag to keep hand cool. The insulation on the handle needs to be thicker. I'm very pleased with this fry pan. It's good quality for the price, and super easy to clean. It has been the perfect size for me to cook a small serving of vegetables or a couple of hamburgers. I love these pans, I have a few of them in different sizes. They are brilliant for cooking fish, chicken, or just making eggs for brunch. Small non-stick frying pan is great for preparing single orders of chicken and steak for sandwiches and salads. Wash up nice and the non-stick finish lasts as long as you use silicone tongs etc. This non-stick pan is great for cooking our breakfast omelettes at the cafe. The cooks love the fact that the non-stick surface last a lot longer than other products. Great prices on these pans as well. The coating is staying and it is very easy to clean. It is great for eggs, frying sandwiches or veggie dishes. Cheap in price, but not in quality. I have purchased many non-stick pans that wore out and the Teflon came off. This pan is quality and I love it, easy to clean, works like a charm and it will be with me for a long time. I will no longer buy another pan from a big box store. I had to double check when I saw this amazing price. I just wanted a simple nonstick pan for making eggs because I can no longer stand using aluminum pans for this because it is way too much to clean. This is amazing! Really good pans, works great for cooking eggs. The pans have a good weight to them and great balance so they do not tip over on the stove top. Nice non-stick fry pan. Does well with our assortment of seafood pan seared items. Our food comes out to perfection with little to no burns or dryness on the food. The pan is a great deal. It seems durable and has a nice nonstick coating that worked great for cooking an egg in. it also cleaned up well. The price is excellent, which is especially important in a nonstick pan, since all nonstick pans have limited lifespans, even when well cared for. The handle isn't the best, but it is serviceable, and you can cheaply and easily add a silicone cover onto it easily, for a better experience. We used these pans for an event that needed a omelet station, the pans worked perfectly just the right size and conducted heat well also. This pan works great for any cooking needs. We will still spray the pan to be on the safe side of having the food stick. We use a lot of these fry pans daily in all of our restaurants. It has now become our favorite type of frying pan to use. My favorite pans ever. You cannot beat the price! High quality and the metal keeps it shape, I am about to order more of them. I bought this pan for my sister as a housewarming gift and she left it. It's one of my favorite pans and I own them and pretty much every size. They are amazing quality and the price is absolutely unbeatable. Great pan for omelets. Just keep metal utensils away. Once the non-stick coating is scratched the pan is a loss. If you can manage to train the employees in the morning to use wooden or rubber utensils then you are going to be fine. We use a lot of these and will continue to purchase them as it is a great product when cared for correctly. Go to small frying pan for our cooks. Very well made and do not scratch easily, and are truly non stick. Stock up on these! Our go-to line cooking vessel. They're cheap, they hold up forever, and the non-stick is key. Gotta have that non-stick. We use them for eggs, steaks, all kinds of things and they work great. This little 8in aluminum non stick pan is absolutely amazing. They arnt kidding when they say non stick. The quality is awesome and you can't beat the price. Perfect omelet pan! This pan is perfect! Just like it's bigger brother the 12", it's really easy to clean, heats evenly, and has the non-stick coating of dreams. I have liked ever Choice pan I have ordered. This pan is no exception. I bought it to go with the butane gas burner I also got from the site. It will make a great addition to my pan collection. This pan is are all around number one pan. We use it daily to cook and create EVERYTHING. One of the best parts is that it is non stick and you don't need to add any additional fats. Choice 8' non stick pans worked exceptionally well for my catered omelette station. Nothing burned or stuck to the pans. Easy release. Completely non stick. These are very wrong pans they are great for making French toasts the egg mix will no stick and will make a great brown layer. These pans are the perfect size for crepes. The non stick surface eliminated the need for any grease while churning out perfect crepes every time. I purchased the Choice 8" Non-Stick Aluminum Fry Pan (Item #: 407FRYPANNS8) specifically to make omelettes. The instructions included seasoning the pan before use (to prevent discoloration) by adding oil and heating it over medium-high heat, doing this three times. I followed the instructions and the pan works excellent. Good size for two eggs. Easy to clean. I bought the silicone grip as well. Great pan for the money! Will buy more of these again. This size is great if you want to make eggs for yourself. They are nonstick but scratch easily. I learned the hard way. Cheap but quality! It is great for cooking eggs and the clean up is quick. The frying pan is well made and doesn't change shape when it is heated. The coating holds up well. Great for omelet stations, or cooking classes where they are making an individual portion of something. The nonstick is key for cleaning. Handle is a good length, but advise to use a pot holder or towel if cooking for a long time as it does heat up. The nonstick coating on this pan is exceptional. Omelets and scrambled eggs are no match for this and slide right off onto the plate. Cleanup is equally a breeze. A year after moderate use, the coating is still holding up very well with no sticking issues. first impressions of this pan are positive. it's the perfect size for omelets and other egg dishes, as well as small portions for one to two of other things. you need to buy the handle cover separately, which is a bummer, but all in all its a good pan. This fry pan works well when I need a non stick pan. I love it for cooking eggs and omelets. The non stick coating seems to work well. Great non-stick pan for those early Saturday morning fried eggs that my family likes to eat. Just the right size and with the perfect curving of the pan, eggs can be flipped in the air so they can cook on the other side. I plan to purchase another one of these and also a larger one for sauteing as that is our preferred method of cooking over high heat! Best non stick frying pan. I use the silicone sleeve on the handle for better safety. Love it. The size is great for smaller quantities. I used this the day it came in the mail! I've has the same pots and pans since college (actually before) and wanted something sturdy and industrial to start a new pots and pans collection. This does that to a T. I like to cook with products that I know I can manhandle and still it will survive; this does that and more! Even cooking, long handle, sturdy weight! I love it! This has to be the best egg pan I have ever had. It is the perfect size for 2 eggs. Even my husband likes it. I love this pan. Its non stick and it's definitely non stick - my ingredients literally go flying around in the pan. Easy clean up, pretty scratch resistant. These Non-Stick Aluminum Frying Pans get the job done however the coating appears to come off very easily and they you end up having to purchase another pan. We're known for having one of the best omelets in the area so cooks go trhough a lot of Fry pans, so having to replace pans on a regular bases won't hurt our budget. This fry pan is very easy to clean and the non stick coat works great. We buy our non-stick fry pans from Webrestaurant.com. The prices are affordable. We have no problems with ours yet. This one is a good one for small things to fry. Great pan for the price. A little cheaply made made but for this price we can buy a few and change them out as needed. These are great pans and the price is so low you can stock up on them for the kitchen. They make the perfect eggs and omelette every time and are easy to clean after. I have an older version of this pan that I got a long time ago. I have used this pan for eggs, sauces, grilled cheeses, etc. The surface is extremely durable and has no scratches. Highly recommend. Nothing ever sticks!! It is absolutely great for omelettes. Even when the cheese oozes out it doesn't stick. It is built like a tank too! This non stick pan works like it should: anything you put on to cook will not stick to the pan. The name of the product pretty much gives you its function and its a great pan to use. These pans are great. Non-stick and priced right so that you can buy a dozen and not worry about if they will hold up. They hold up pretty well as long as you remember to not use metal in them. I would recommend these as a durable and affordable saute pan. Having insulated handles is, of course, always better than non-insulated, but you cannot beat the price. highly recommend. Nice non stick fry pan. They are the Perfect size. perfect to use for our breakfast. Easy to clean. We recommend these pans , nice product. Cook's dream. A small but useful frying pan. Easy to move around and quick to cook. Can serve multiple uses and keeps going. It will your cook's favorite. This size pan is not likely to be the backbone of your restaurant, so for a smaller pan that gets used occasionally it's probably fine. Keep in mind that the weight and coating durability is on par with a mid-price consumer pan, so if you're stocking an omelet bar go for something better. As long as you're expecting a consumer-quality product, you will be very pleased with the price. Remember that the metal handle is not insulated, so you will need a grip or hot pad. We needed some non stick pans and didn't want to spend too much money in the process. These pans work great and are priced great as well. Not knowing much about frying pans, I came across this size one. I wanted a fry pan to make scrambled eggs in. This frying pan did just the right job for me. I was finally able to make scrambled eggs without my hubby the retired chef helping me again. It is so durable to use. Cleaning is a breeze, just wipe clean inside with a damp clean cloth., The price you cannot beat. I also purchased other sizes in case I want to cook something much bigger than eggs. Great Pan to work with in the kitchen, an not had any issues from it. Came to me just the it says an was please to have got it. This frying pan has been used at least 100 times and still looks and feels brand new. It has the perfect depth and a good solid feeling to it. The non-stick has worked unbelievably well with no sign of slowing dow. Clean up is a breeze. I gave it four stars instead of five for its one flaw - the handle does get quite hot, so compensation will need to be made accordingly. Sill, overall this is an incredible investment for it's small price. I'm buying more now! A great small fry pan to have at your disposal, I melt butter, fry eggs, etc. I definitely would re:momend this pan for any kichen at home or in a commercial kitchen. Again not a bad pan for the money, under 10 bucks for the thing but they just don't stay 'non stick' very long within a couple weeks the surface starts to scratch off easily. Theses are the best non stick pans. The price is great and they are alot better than most of my expensive non stick pans. Every restaurant should have theses pans. Best little buy for our kitchen. Ordered multiples along with the silicone pan handle grip. Can't beat the price and can't have enough of these. Priceless for any busy restaurant kitchen. This pan seems to be more non-stick than some more expensive pans I have. They are also a bit deeper than other frying pans which makes for a more useful pan overall - I scramble eggs right in the pan rather than whisking them first then pouring in. The handles are a bit long and heavy for the size of the pan which causes them to tip a bit while in use. 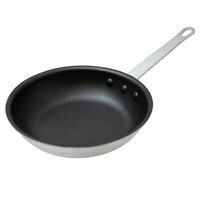 This pan is a great item to have in the kitchen for sautéing, we love the non stick surface. I would recommend getting a rubber cover to put on the handle as it gets very hot if sitting on the stove top. These pans are the best , super non-stick coating , foods will not stick. Very durable too , heavy duty rivets and thick aluminum clad. I love doing Parmesan crisp in this pan , and that is hard to do if you don\\'t have a high quality non-stick coating. At this price you will not beat this pan! Great, holds heat well, has sloped sides so all the corners/edges are easy to get into. As with all nonstick, be sure to use rubber spatulas or similar tools as not to scratch the coating off. Also highly recommend purchasing silicone sleeves for the handles, which are available very cheap here too, as they are metal and will get very hot. This is probably common sense to anyone who's worked in a restaurant, but home chefs might not know.